Summers states that his photography may indeed be influenced by his absorption with music and that in a sense the photography he creates is a visual counterpart to the music that never leaves his head. Thus in Summers musical predilections – that may be termed as a taste for the melancholic, the convulsive melodic line, the dark chord with a few stray notes added – we find the brooding minor key photography he is attracted to. He adds that music and photography are kindred spirits in that they are nonverbal arts, but handily, may have interchangeable terms. He describes his own act of photography as tearing pages from a book and then reshuffling the results into a new visual syntax. Desirer Walks the Streets is the third monograph by Andy Summers and his first for Nazraeli Press. Andy Summers has been active as photographer since 1979 with numerous exhibitions, magazine essays, publications, and recently, keynote presentations of his photography. The recipient of a large number of music awards he is also a Doctor of the Arts and a Chevalier des Artes et Lettres. Below are photography books by Andy. Visit the writing page for additional titles with text written by Andy. Andy Summers, guitarist of the rock band The Police, presents the visual equivalent to his musical work in this career-spanning collection of photographs, accompanied by essays from Summers and prominent French photographer and critic Gilles Mora. The insider: The Police on tour photographed by guitarist Andy Summers. In the early 1980s, The Police went on tour accompanied by a photographer who documented the band behind the scenes in a series of candid and striking black and white photos. This talented photographer also happened to be the band s guitarist, Andy Summers. Yes, it s true 9the man responsible for the guitar lick from “Every Breath You Take” was not only the backbone of one of the most popular bands of all time, he also possessed a visual gift for composition and mood that allowed him to capture the spirit of The Police better than anyone else could have. 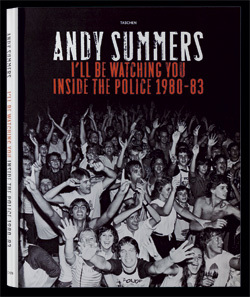 Andy Summers’ 1983 black and white photography book Throb documents his travels and life on the road with the Police. Throb was originally published by the William Morris Press Label and is currently out of print. Andy Summers photography has been exhibited at elite galleries and museums around the world. Past exhibitions of Andy Summers photographs include showings in Paris, Paddington, Tokyo, Montréal, New York City, Barcelona, Los Angeles, Miami, Toronto, Boston, and Las Vegas. His work has also been published in magazines and Andy has recently begun giving keynote presentations on his photography. On this site, you can explore Andy Summers photographical works by viewing online image galleries which include striking pictures from Throb, I’ll Be Watching You, and Desirer Walks the Streets. You can also look at Andy’s black-and-white photos from his exhibition at Beaux Arts.